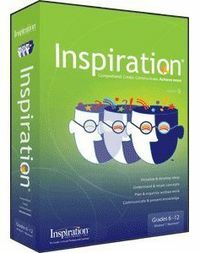 Inspiration Software®, Inc. is the recognized leader in visual thinking and learning. Students, educators and 21st century business professionals use our products to think, brainstorm, organize, analyze and write. Recognized as the leader in visual thinking and learning, Inspiration® Software's award-winning technology tools are based on proven visual learning methodologies that help students and educators think, learn, brainstorm, analyze and write. The company's visual learning tools are used by more than 25 million people worldwide and are revolutionizing visual thinking and learning in education. Investigate, analyze, and represent data and information in dynamic graphs and charts. 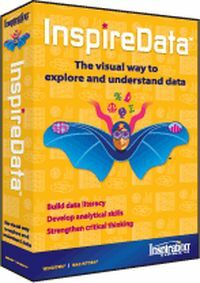 Collect data from multiple sources including experiments, library and Internet research, user-created e-Surveys or one of the 100+ subject-specific databases that are part of InspireData. Combine pictures, text, numbers and spoken words to develop vocabulary, word recognition, reading for comprehension, and critical thinking skills. 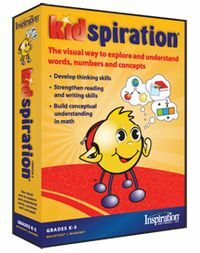 Kidspiration offers activities in all curriculum areas, so students use visual learning naturally and confidently. Using words and picture symbols through multiple visual mapping techniques, Inspiration products encourage the user to think creatively and strengthen understanding of core concepts. Combining technology with visual learning instructional strategies creates powerful tools for helping students build 21st century thinking skills. Research in both educational theory and cognitive psychology reveals that visual learning is among the best methods for teaching students of all ages how to think and how to learn. It can help students build creativity and the strong critical-thinking, problem-solving, collaboration and communication skills needed for success in school and in life.